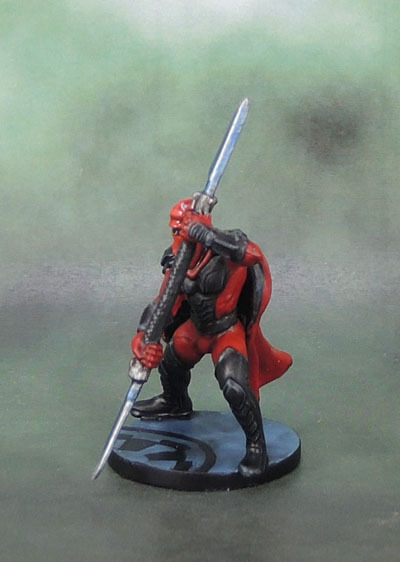 Star Wars Imperial Assault: Emperor’s Royal Guard Champion (Carnor Jax) (Jewel of July ’18) | Azazel's Bitz Box. 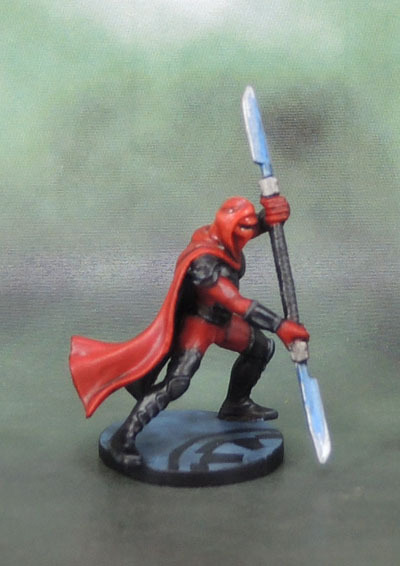 Today’s model is an add-on Imperial Villain from the Imperial Assault boardgame, the (Emperor’s) Royal Guard Champion. Going by the colour scheme, there’s clearly a basis in Carnor Jax specifically, and perhaps a little of his frenemy Kir Kanos. Apparently Carnor Jax is what’s known as an Imperial Sovereign Protector, Kir Kanos on the other hand, is an Elite Emperor’s Royal Guard. 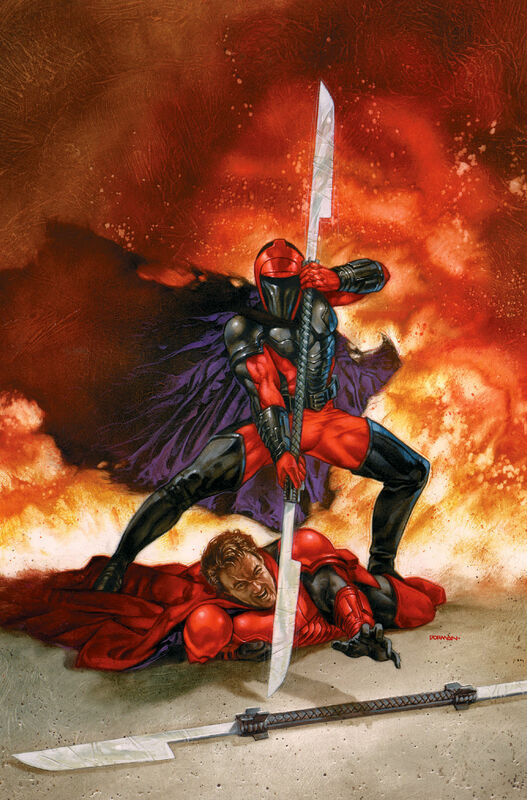 Both are from some Comics called Crimson Empire, and that’s about all I know, and slightly more than I care. 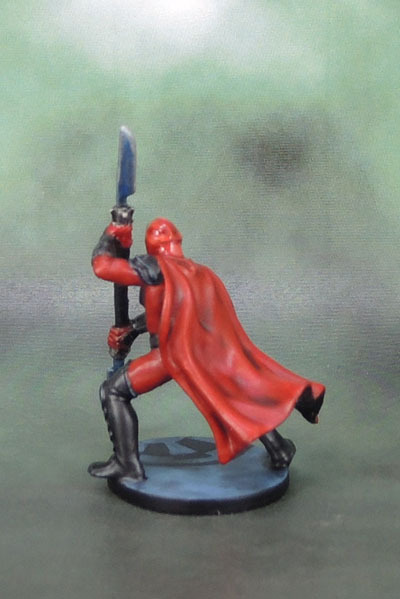 I painted my Royal Guard Champion somewhat like Carnor Jax, but forwent the black face mask and painted the cloak with a red outer and a black inner. I liked the idea that if he stood up and let his cloak fall, that he’d be almost indistinguishable from a standard Royal Guard with a red helm and robe. I also gave him the Imperial Cog on his base in lieu of a red rim. Because “Hero” type model. 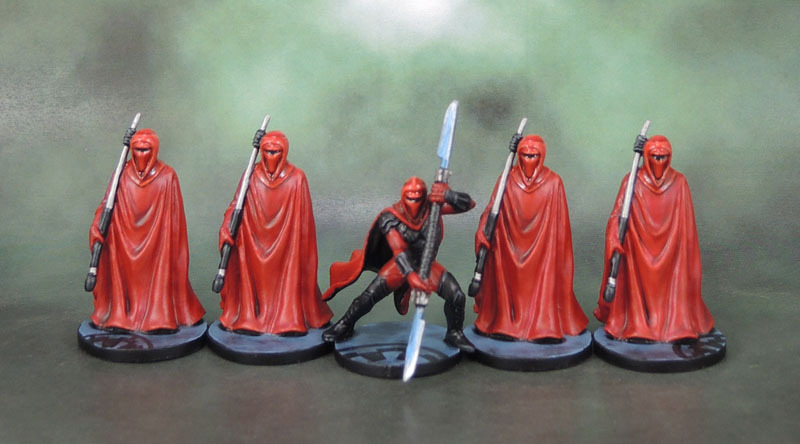 Finally, a shot of him alongside the four “Regular” Emperor’s Royal Guard. Not my most amazing paint job by any means, but like the Royal Guards, he’s certainly fit for purpose. 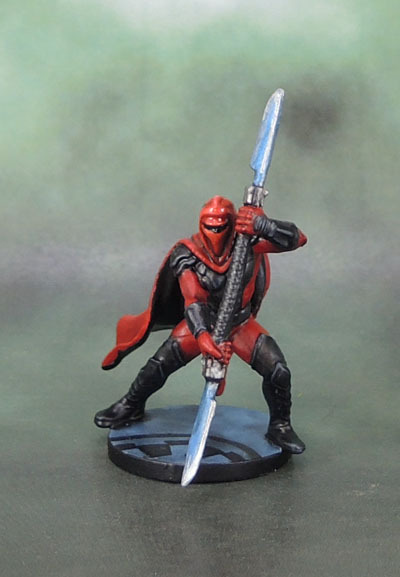 This entry was posted in Board Games, Star Wars and tagged Carnor Jax, Emperor's Royal Guard Champion, Imperial Assault, Star Wars, Star Wars Imperial Assault: Emperor's Royal Guard. Bookmark the permalink. Ah yes, I’ve heard (read) The Redcoats are Coming in the past! So *that’s* what brings all the boys to the yard! 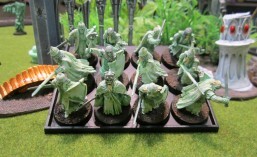 Good stuff mate – I never knew much about those guards but I always thought they looked cool. Thanks. To be quite honest, I skipped over almost all of the Star Wars EU since my glancing “WTF is that?” browsing on Wookiepedia and the like showed just how badly much of it disappeared up it’s own backside, with every minor character or creature having some long, drawn out backstory that kept intersecting the main story and characters way too many times. Fanservice gone terribly, terribly wrong and overboard. Pingback: Star Wars Imperial Assault: Gaarkhan the Wookiee (Jewel of July ’18) | Azazel's Bitz Box. Pingback: Star Wars Imperial Assault: General Weiss & AT-ST (Mechanical November ’18) | Azazel's Bitz Box.